I’ve carried a camera with me just about everywhere for most of my life. At first was one of those long 1990s 110 cameras that sort of looked like hand-held tape recorders. Then my dad gave me his 35 mm and my love for photography grew. After that I got a Polaroid and became addicted to being able to see the photo I’d taken right away. Well, almost right away. I was one of those impatient people who would shake and wave the photo until the image appeared a mere 90 seconds later. 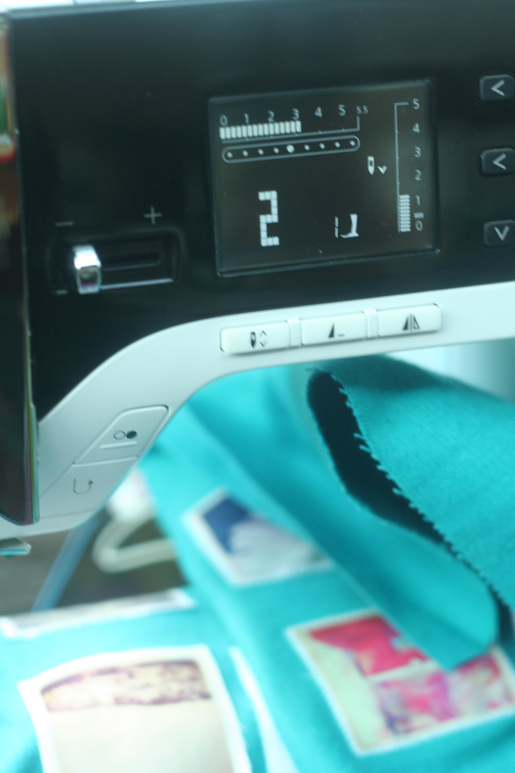 My first digital camera solved my anxious shaking problem because now I could see the photo right away. The only bummer was that my digital camera was an SLR and it was heavy and I was always telling people to hold on just a second while I adjusted the light settings. Then came the iPhone and I finally met my camera soulmate. Even if I didn’t feel like lugging around my heavy DSLR with me, I always had my phone with me. My iPhone solved all my photo-obsession problems because it allowed me to not only take high-quality crisp photographs but also edit them immediately with an app like Instagram and make them look like Polaroids or blur the background for a SLR-ish effect. A few weeks ago I was looking through all my Instagram photos and feeling a bit sad that they only existed on my phone. I thought about printing them out and putting them in a photo album. BUT . . . how often do we sit down at the dining room table and pour over photo albums for hours? I wanted to create something with my photos that I could look at everyday. Recently, I bought a new couch that’s quite a bit bigger than my old one. I had a few pillows for it but they were plain and boring. 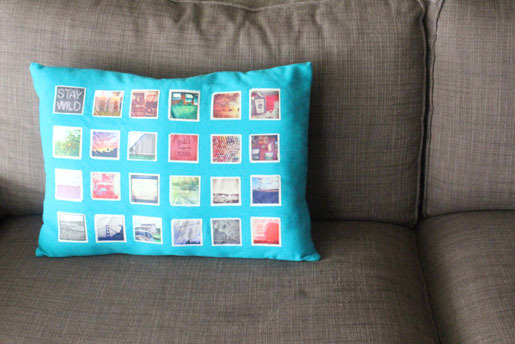 I married my need to turn my Instagram photos into functional art and my desire to spruce up my new couch and I came up with this Instagram photo pillow DIY project. 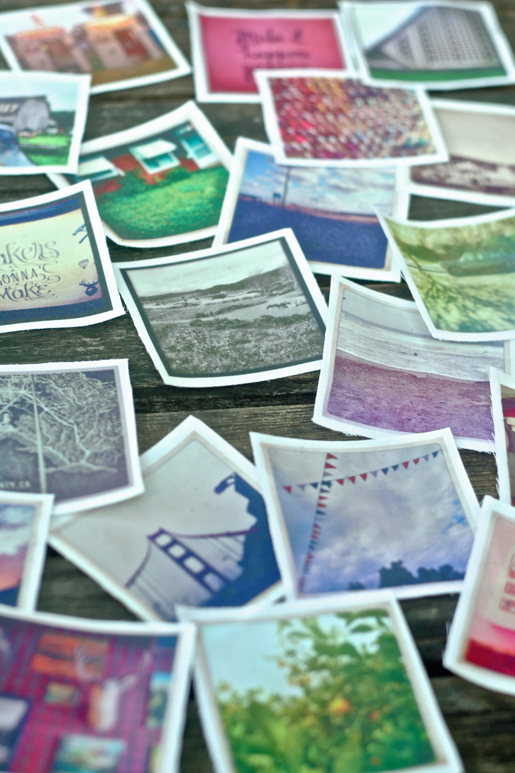 You don’t have to use Instagram photos. In fact, you can scan in photos of your family through the years and make an awesome present for your parents or another family member. I was thinking about how cool it would be to use photos of a couple and then give it to them for a wedding or anniversary gift. Now that I made this one, my mind is swimming with ideas for future pillows featuring themed photographs. 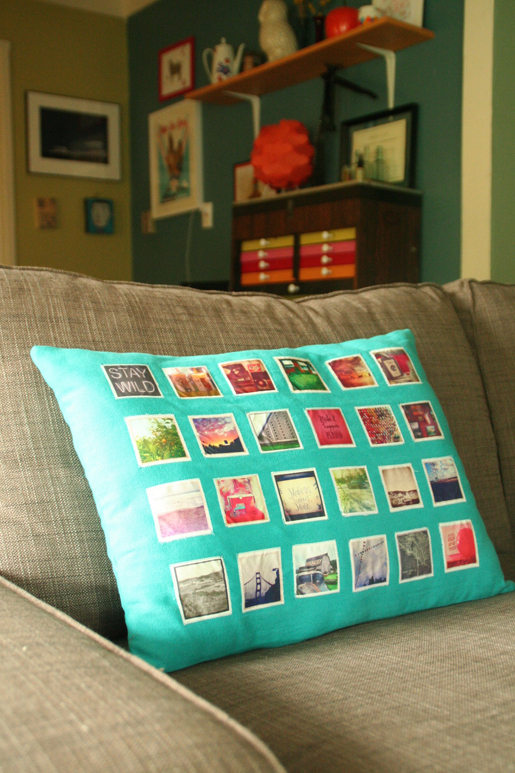 The satisfaction isn’t as instantaneous a watching a Polaroid photo develop before your eyes, but unlike my Polaroid pictures that sit in a rarely-viewed photo album, I look at this pillow everyday. Step 1) Prepare your photos. 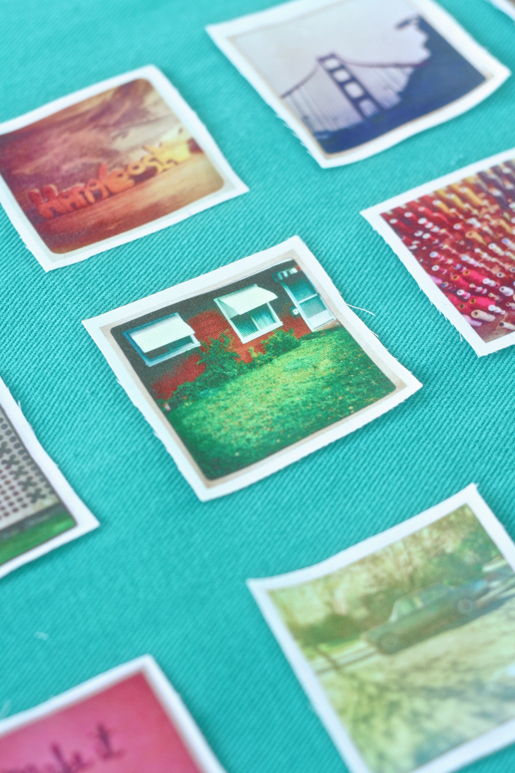 Size your Instagram images in a photo editing program like Photoshop so they’re in contact sheet form and each is 2.5 x 2.5 inches. 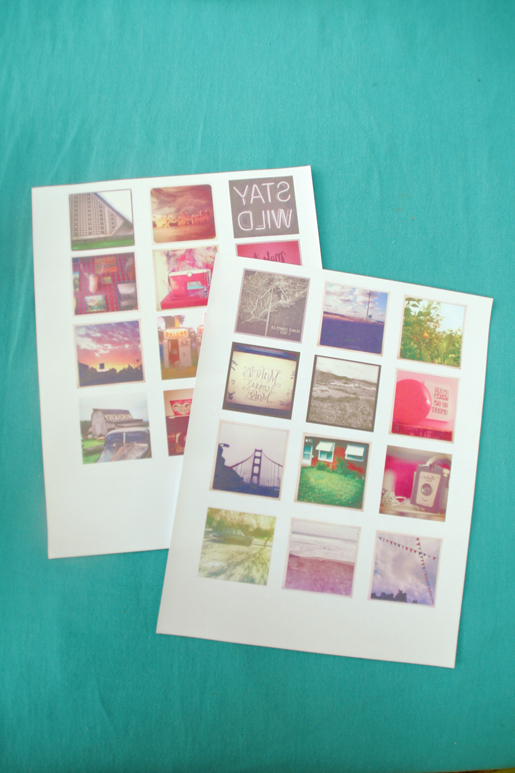 Flip each image horizontally (side-to-side) so they’ll be reversed when you print them. 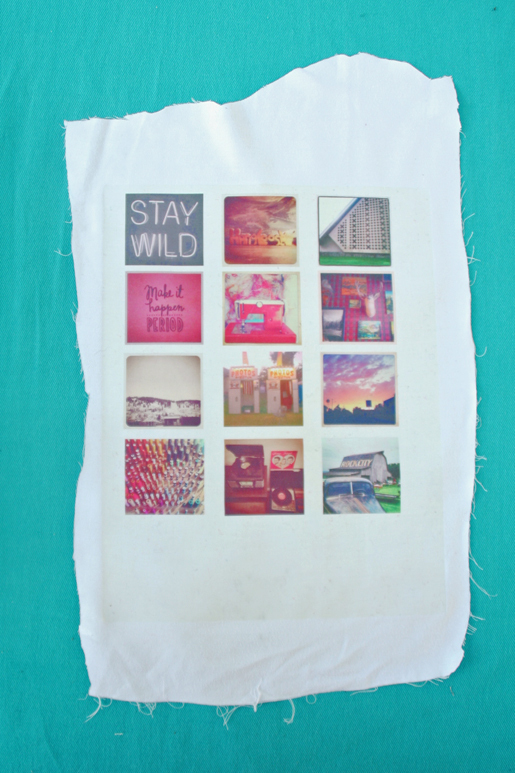 Print out the contact sheets of your photo images on ink-jet transfer paper. 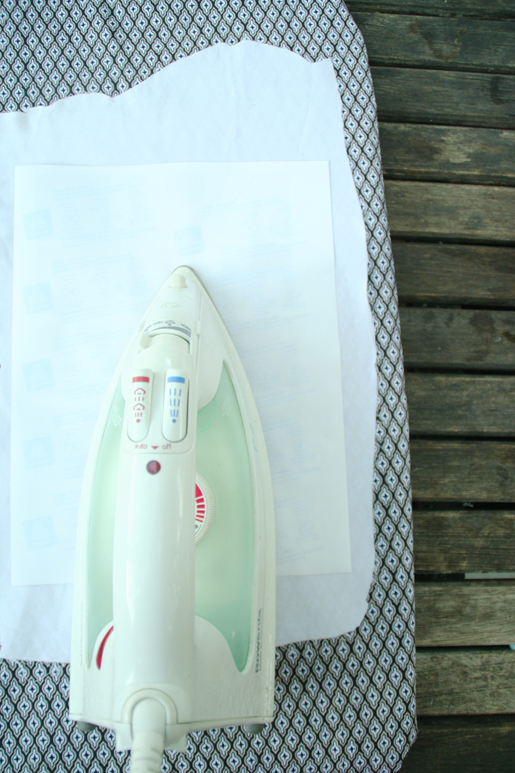 Iron the printed ink-jet sheets into the pieces of white fabric according to the ink-jet instructions. Tip: Press hard and use both hands. 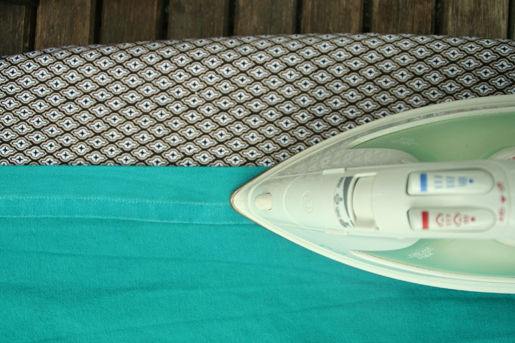 Wait for the fabric pieces with the sheets adhered to them are cool, then carefully peel back the sheets. 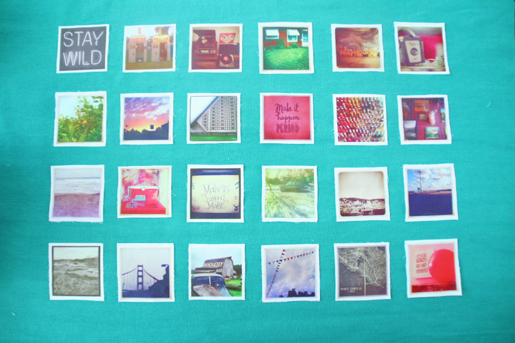 Cut out each image, leaving a 1/8 inch border around all sides. 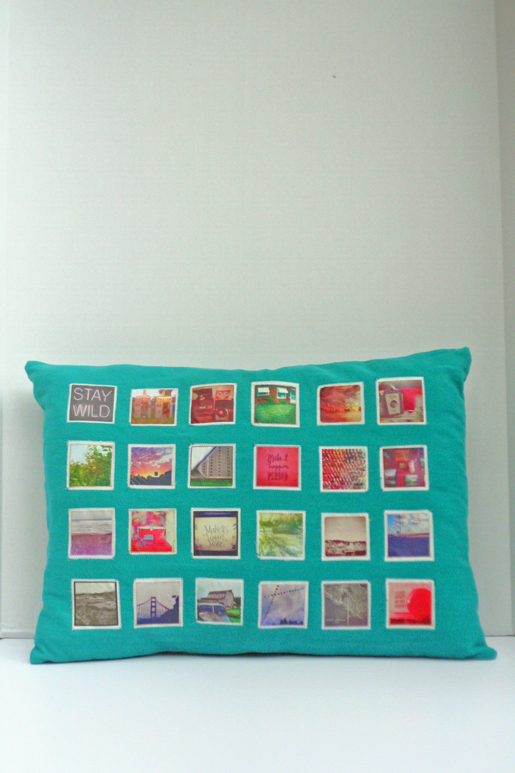 Step 2) Create the Instagram pillow front. 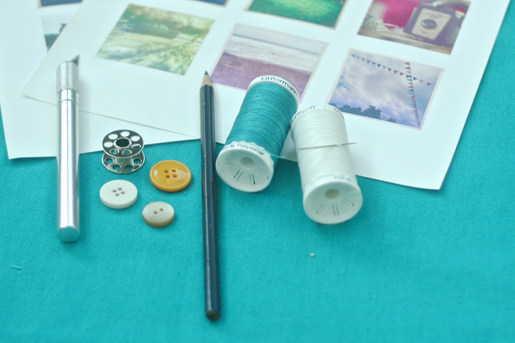 Decide on the placement of the images on fabric piece A (this will be the front of your pillow), placing them in a pattern of 4 up/down and 6 across with about 1/2 inch between the top, bottom and sides of each photo. Adhere the images to your pillow by spraying the backs with spray glue and placing them back in position on the pillow front. 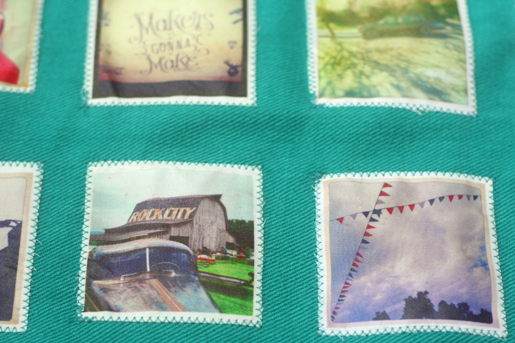 Using a zig-zag stitch that’s about 3 mm wide and 1.5 mm long, applique the photo images onto the pillow. Step 3) Make the pillow back. 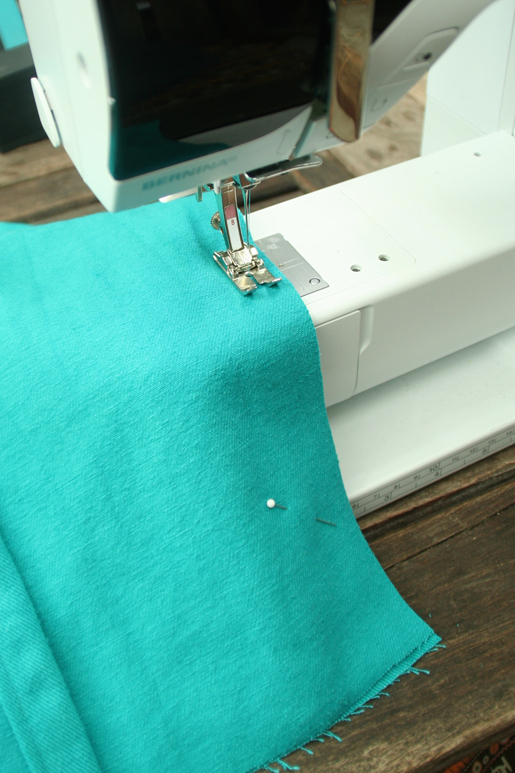 Fold over 1 inch along the upper edge of your B piece of fabric (part 1 of the pillow back). Iron the fold. Fold it over again and press. 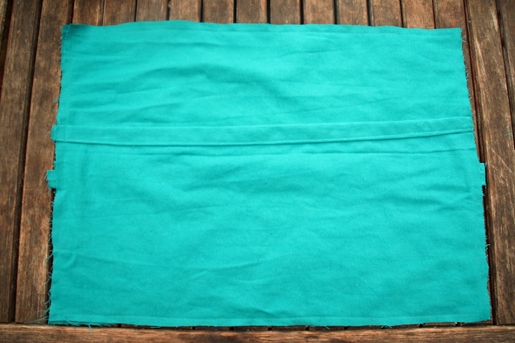 Hem it using a straight stitch. Repeat for the lower edge of piece C (part 2 of the pillow back). 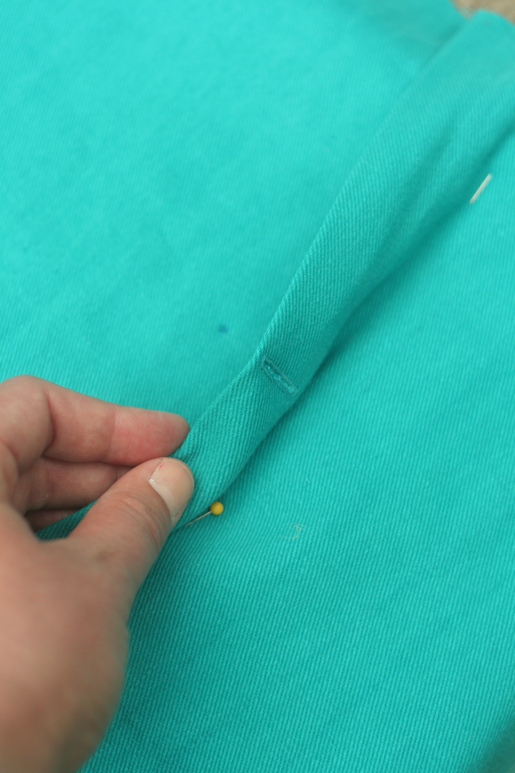 Create buttonholes on the hemmed section of the bottom piece of fabric (B) for the pillow back. For button placement: I started by putting the middle buttonhole in the middle of the pillow and then put the other ones about 4 inches to the right and left. 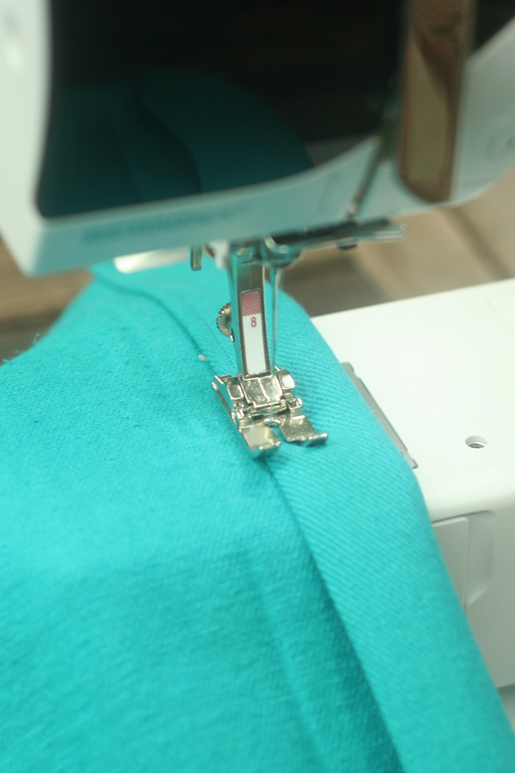 Tip: Use the automatic buttonhole feature if it’s available on your machine. 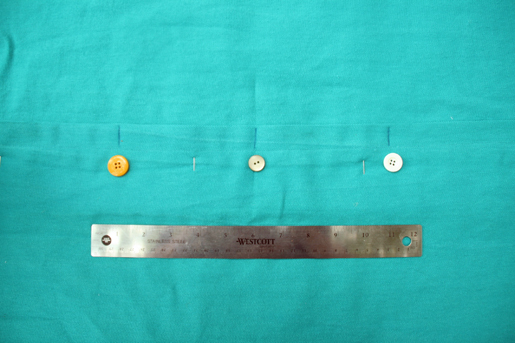 Use an X-acto knife or buttonhole cutter/chisel to open the buttonholes. 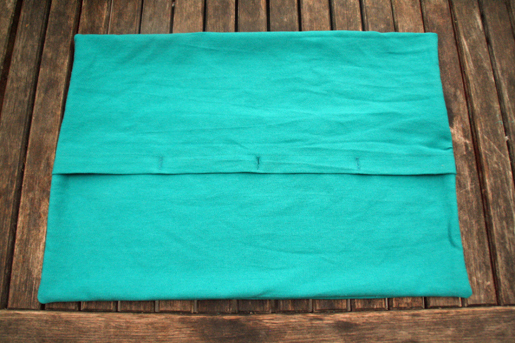 Lay down the back pieces (B and C) so they overlap and are the same height as the pillow front. 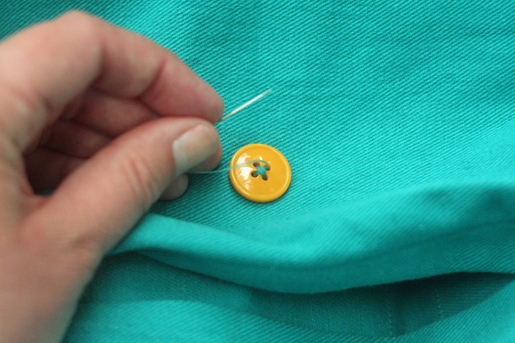 Then mark the spots on piece C where you’ll need to place the buttons. 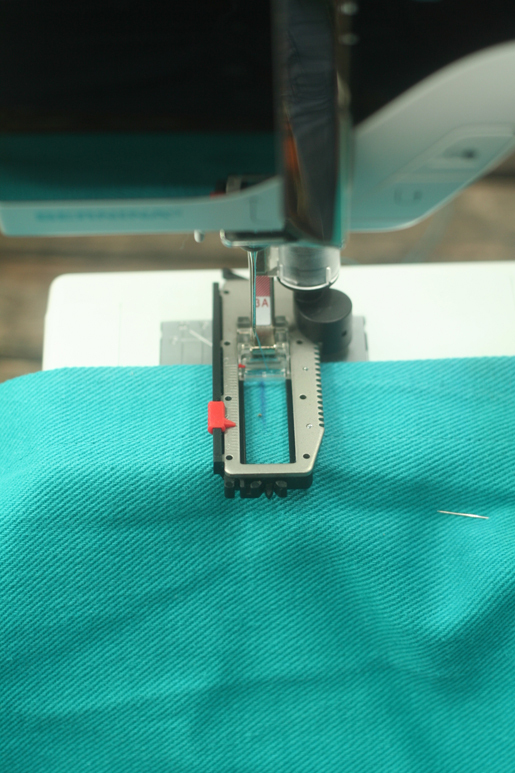 Hand sew the three buttons on piece C.
Step 4) Assemble the pillow. 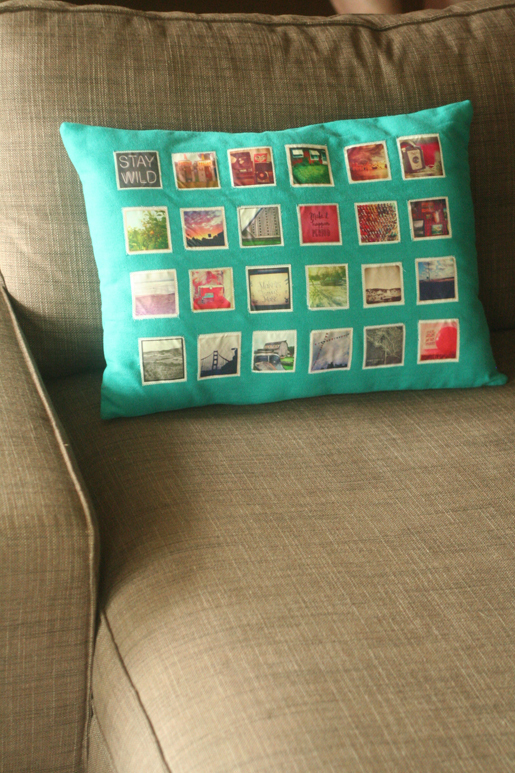 Place piece A (front of the pillow) on the table or flat surface with the photos facing up. m edges of the pillow back to match the pillow front. Pin all the pieces together. Sew across all four edges of the pillow. Turn the pillow right way out. Stuff the pillow and button the buttons. This is a great idea. I cannot wait to get started on this project with wonderful photos I have of Montana. I’m going to make two with different photos. Love, love love it!